Envision IT is Oracle Application Development company based in Melbourne, Victoria, Australia. Our 'Oracle Practice' covers development, upgrade and migration of enterprise Oracle Applications, databases and their integration with Oracle and Non-Oracle systems, devices, equipment, IoT, RFID and Sensors etc. This may involve developing or migrating applications on or to Oracle Cloud such as AI, Automation, Chat Bots, Voice to Text and Text to Voice Apps, Voice Authentication, Handwriting recognition etc. On the licensing front, you may buy Oracle Products such as databases, middleware, upgrade existing hardware or cloud credits. Organisations of all types such as Autonomous bodies, Business, Charity, Education, Government or Manufacturing have a lots of legacy assets. Some of them highly risky to and even more risky to upgrade! Allow us to treat these assets with respect and transition them into new age systems complete with AI, Automation, Chat Bots, Charts and dashboards, data analytics and speech recognition based fully integrated systems that you can access over PCs and mobile devices, as an app or on web! Our proven iterative methodology ensures you get these well-tuned, highly productive and efficient systems within 'fixed costs' and 'fixed time' quicker and with certainty! Your team will be acclimatised with the products as they are rolled out. We can integrate any system such as Accounting, Active Directory, CRM, ERP, Finance, HR, Manufacturing, Payments to deliver easy to use, seamless and fully integrated highly productive and efficient systems. To make it happen for you, we are offering to do a 'Free Proof of Concept' for your chosen project. This can involve up to 150 Hours of effort. We will organise required cloud credits for up to one month! When you follow it up with a paid project, then we will provide cloud credits worth 25% of your project value or $20,000, whichever is lower! The offer is available till 15 Nov 2018. One month is a long time for us. You will be amazed to find how much you can achieve within a month! We are keeping this deadline so that we deliver your project before we close for summer holidays! So why wait, Contact your Oracle Account Manager or call Steve on 0425 732 510 or email to make use of this offer. Envision IT Oracle Application Development practice develops new applications or upgrades and migrates existing applications (Oracle or non-Oracle) to Oracle technologies. This includes making use of Oracle databases, Middleware, Autonomous Cloud, AI, Chat Bots, Integration etc. We develop On-Premise (browser based or desktop applications), On-Cloud and Hybrid applications. We come from a multi-technology background and provide you fully integrated solutions that will interact with your other enterprise technologies such as Apple (for Apps), AWS (Voice Authentication and Voice to text and text to Voice), Google (Android Apps, Voice to text and text to Voice), Manufacturing Systems (MES, PLM, Manufacturing related ERPs), Microsoft (Active Directory, Office, Windows App, Windows Applications, Windows Servers), Salesforce and SAP etc. We will provide you a seamless experience across varied technologies. Our products are known for high productivity, efficiency, reliability and ultra-low maintenance. As with all our projects since 2002, Envision IT advantage lies in delivering your projects, however complex, risky or large they may be, with certainty, within 'Fixed Cost' and 'Fixed Time'. We will deliver them with ease, without stress and quicker than you would think. Our proven 'iterative methodolgy' will ensure that you get a product that is fine tuned to your requirements. Envision IT Oracle Cloud practice opens the world of Oracle Cloud by easing implementation of your projects involving Oracle technologies and specifically, Oracle Cloud. This may involve AI, Charts and Dashboards, Chat Bots, Integration between different Oracle and other non-Oracle industry products using Oracle Integration Cloud, Automation of your business processes, upgrading, transforming and migrating old Oracle Applications, migrating Oracle data, develop websites using Oracle Experience Cloud, implement speech Recognition, making use of Oracle Autonomous Mobile Cloud and all that you need to with Oracle. We live in a world that is moving faster than ever, especially in relation to technology. Unlike earlier, users now demand technology to be delivered quicker and it must be intuitive and easy to use. Over the past 7-8 years, the trend is make use of existing solutions rather than creating everything from scratch. Most of these resources are available on the web e.g. speech recognition, voice authentication, data analysis tools, artificial intelligence tools etc. And then, we live in a world that is now increasingly adopting 'shared economy' e.g. Uber. By consolidating knowledge of tools like 'speech recognition', we are able to provide better quality and improve systems over time. It saves development time and implements projects or go live quicker. Cloud environments also save costs when you use resources for some time rather than all the time. To sum up, you get improved products, go live quicker and save costs! Oracle cloud provides ready to use utilities and systems to implement AI and Chat Bots that can reduce development and go live time from a few hours to a few days. Contact us today for a 'Free Proof of Concept (PoC)! Oracle cloud provides ready to use utilities and systems to implement dashboards and charts along with utilities for integration that can reduce development and go live time from a few hours to a few days. Contact us today for a 'Free Proof of Concept (PoC)! Oracle cloud provides ready to use utilities and systems for automation of tasks that can reduce development and go live time from a few hours to a few days. Contact us today for a 'Free Proof of Concept (PoC)! Oracle Integration cloud provides ready to use utilities and adaptors for integration with several Oracle and Non-Oracle systems including but not limited to products from IBM, Manufacturing Systems, Microsoft, Saleforce, SAP etc. This can reduce development and go live time from a few hours to a few days. Contact us today for a 'Free Proof of Concept (PoC)! Choose self-managing, self-repairing, and self-securing Oracle Cloud Platform autonomous services to focus on innovation—not on administration. Oracle has announced the availability of multiple Oracle Cloud Platform autonomous services, including those for database, development, mobile, business analytics, integration, blockchain, and more. With this flood of new autonomous services, how will organisations prepare to administer them? 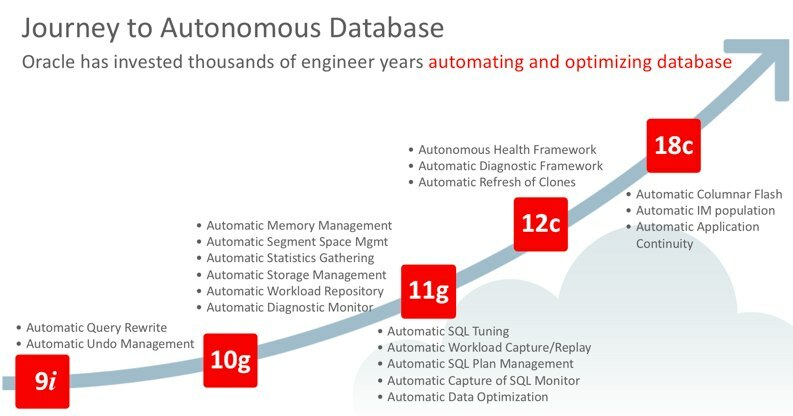 The autonomous capability enables lower operating costs, improved security and reliability, and lower IT labor costs, and it gives database administrators more time to focus on new ideas instead of tuning databases and allocating storage. Make use of Envision IT's proven 'iterative' methodology for your Oracle Applications upgrade and migration, either to new systems or cloud. Our services will upgrade Oracle applications and data without any stress and with certainty. The outcome will be a new age enterprise application that integrate with your other enterprise systems, whether on premise or cloud, makes use of new easy to use tools such as Apps, AI, Chat Bots, Speech Recognition, Face Recognition etc. to deliver a smooth seamless experience with organisation-wide visibility. Our iterative methodology will engage stakeholders, acclimatise and train them as the product is developed. Data migration is Envision IT mature practice that precedes its inception. We can migrate any data from any platform to any. You may like to make use of this service to migrate historical data from Oracle or non-Oracle systems to new platform. In this sense, we will cover any platform. If you have data residing in 3GL, 4 GL, archaic databases such as Unify, Ingres, old versions of Oracle, Lotus Notes etc., contact us today.